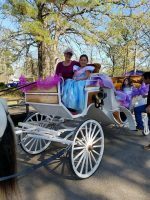 Take a Cinderella Carriage ride to a beautiful majestic setting for a romantic evening with that special someone. Enjoy champagne, cheese, crackers, grapes, music and a great conversation under an oak tree canopy looking out at mother natures finest creations. 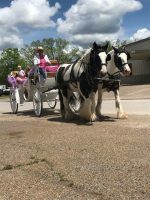 Climb back in the carriage for an evening tour of the ranch. Definitely a date like no other. Great way to spend your anniversary, first date or special occasion. Date night is by appointment only, starts at 6pm. A Dozen Roses, overnight stay and specific music available for an additional fee. Reservations and Paypal payment in advance is required. Please fill out the form below and it will take you directly to paypal.